Following up the last post, here are my quick suggestions for wines to match with your Thanksgiving meal. 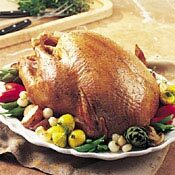 Generally speaking, Sauvignon Blancs go well with poultry and white meats such as turkey, due to the citrusy flavor profile. Some Sauvignons can be “greener” or more grassy than others, so it is up to your taste as to which you pick. French Sauvignon Blancs, such as from Sancerre and Pouilly-Fume, will tend to be more grassy, while those from New Zealand usually have more tropical fruit character. From California, the Sauvignon Blancs can be either, and some are also dosed with oak. Overall, Sauvignon Blanc is a safe choice for most of the foods you’ll find on a typical Thanksgiving table. My favorites for the Thanksgiving table: Geyser Peak, Simi, Brander — all from the US. Personally, I prefer to go with lesser-oaked, or non-oaked Chardonnays when matching with food, because I find an overabundance of oak can clash with food (except hot buttered popcorn). So try to find an oak-free or only slightly oaked Chard from California (if you want to stay with the born in the USA theme), or go with a non-oaked Australian Chard or French Chablis. American favorites for Thanksgiving matches: Francis Coppola Diamond Collection “Gold Label” (it’s actually orange), Edna Valley, La Crema. Always a nice wine for food, Pinot Noir is an experience in itself — and a good one can be costly. However, there are some US-made Pinots under twenty bucks that are delectable and meld well with the typical Thanksgiving spread. Specifically, I’ve found all of Estancia’s Pinot Noirs to have a high price:value ratio, and the winery is in California so it fits in with the “American theme” of Thanksgiving. From the US, I also like the Pinots from Wyatt, Easton, Robert Mondavi Carneros, and Silver Spur. From New Zealand, Drylands and Vicar’s Choice both have excellent Pinot Noirs under twenty bucks, and Kim Crawford has a good one for a bit over $20. Ah, the perennial feast of the United States â€” for the foodie it is the ultimate holiday, with its succulent roast turkey surrounded by what seems to be every side dish known to mankind. And those “other” dishes are what makes the wine match a serious challenge. OK, that was too easy — and chances are you’re not going to buy eight different bottles of wine to go with the myriad dishes. So, if you’re invited to someone’s home for Thanksgiving dinner, what is an appropriate wine to bring? The first choice is Champagne; what better way to celebrate a holiday than with bubbles? Forget the cheap stuff â€” spend some money and get a full-bodied, legitimate Champagne from France. A vintage brut cuvee, rose, or Chardonnay (often called “blanc de blancs”) can carry you through the day, or get a “non-vintage” (NV) for about half the price. Choose one from a reputable house such as Pommery, Mumm, Bollinger, Moet, or Perrier-Jouet. Or, if you’re willing to look a little harder, find a sparkler from Billecart-Salmon or Besserat de Bellefon, two houses that are lesser-known but will provide a great bottle to start the day and will have the power to drink throughout the meal (so maybe two bottles would be better!). The aforementioned Pinot Noir and Pinot Gris are not only good matches for turkey, but will also match with a variety of other foods at the table. If you choose a Pinot Noir, the suggestion â€” as it was with the Champagne â€” is to take the ducats out of your wallet and lay them down on a real Pinot Noir from Burgundy, France. As you may have seen on Sideways, there is something rather special about these wines; a good Burgundy is more an experience than a mere beverage. What better time to drink it than on a holiday, surrounded by loved ones? Finally, if you want to have a white wine at the table, go with either a Pinot Gris from Alsace or a German Riesling. Simple Pinot Grigio, such as from Italy, is OK for appetizers, but doesn’t have the substance to follow along to the main course. Conversely, an Alsace Pinot Gris (which is the same grape, but from a different place) has significant weight in the mouth, much fuller bodied, and adds a riper, spicier note that melds well with both the turkey and many of the trimmings. German Riesling â€” specifically a dry QbA or Kabinett (the designation will be printed somwhere on the label). These wines have a lot of bright, fruit flavors of apple and peach, with searing acidity and mineral notes that pair well with all kinds of foods from creamed onions to sausage and herb stuffing. Perhaps best of all, German Rieslings tend to be around six to eight percent alcohol â€” not much more than a beer â€” so you can drink them all day without feeling the effect of wines double in proof. So there you have it, a quick rundown on several wines to choose from for the Thanksgiving feast. Stop by the site a little later to read about more specific wine suggestions.